As I savor coffee on a honeysuckle-scented terrace, it strikes me that Lanjarón doesn’t look at all weird. South of Granada, on the edge of Spain’s Sierra Nevada mountains, this beguiling little spa town overlooks the ruins of an old Moorish castle. Its spring-fed fountains are tiled with snippets of Federico García Lorca’s poetry. Its whitewashed houses have saintly wall shrines and balconies hung with geraniums. Its long main street is a sun-splashed jumble of florists, tapas bars, and old-fashioned stores stocked with locally produced hams and honey. All so pretty and genteel. But there’s definitely an undercurrent of weirdness. On the Eve of St. John, June 23, its citizens arm themselves with water pistols, water-filled balloons, and firemen’s hoses for an epic midnight water fight. Many jubilant jubilados (the wonderful Spanish word for retirees) join in by tipping buckets of water on unsuspecting passers-by from balconies. The revelry is called la fiesta del agua y jamón, but mercifully there is no tradition of hurling ham hocks and pigs’ heads at each other. Anything piggy is there to be eaten. 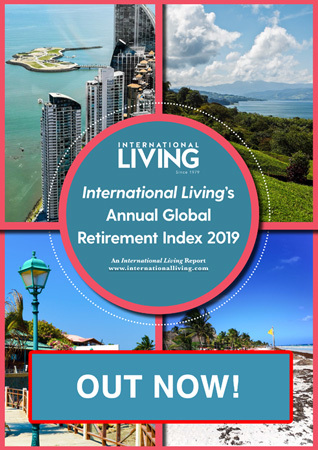 The inhabitants enjoy one of Spain’s highest longevity rates. Exercise undoubtedly plays a part—the paseo, or evening stroll through the town, is enjoyed by all age groups. So does the warm climate and a diet with plenty of affordable fruit and vegetables. But the secret is mostly put down to the local water. Many place-names throughout southern Spain are derived from Arabic. It’s a legacy of when the region was under Moorish rule—and Al-lancharon meant “the field of healthy springs.” Today the town is the source of Aguas de Lanjarón, a bottled water sold throughout Spain. Not that you need to buy it—just fill up your water bottles from one of the fountains. 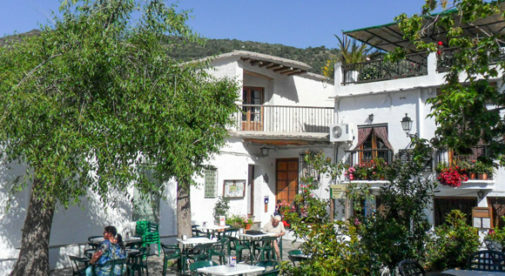 Lanjarón is a gateway to the valleys and whitewashed villages of Las Alpujarras—or La Alpujarra as it’s sometimes called. Covering part of the Andalusian provinces of Granada and Almería, the Alpujarras form the foothills of the snow-capped Sierra Nevada range. Its off-the-beaten-path beauty draws hikers, bird-watchers, and those in search of the tranquil, rustic Spain, but it’s not remote. You can be in the city of Granada or down at the Mediterranean coast within an hour. Mazed with tight alleys, around 50 villages and hamlets are scattered across the hills and valleys. Looking like architectural transplants from Morocco or Tunisia, most of the Cubist-style dwellings have flat roofs—ideal for drying peppers and tomatoes—and tall, cylindrical chimney-pots topped with what resemble little white hats. Some also have trellises swathed with vines, roses, or bougainvillea. Almost every crevice and cranny is stuffed with pots of geraniums and other flowering plants. Particularly in Pampaneira, the lowest of the three villages, the bright displays of artisan-made Alpujarran rugs and blankets hanging over balconied verandahs make you wonder if you’ve somehow landed in North Africa. Then you hear the church bells and remember this is Spain—and that churches preside over immaculately-kept village squares with bars. A favorite tipple is Vino de la Tierra, a wine that’s often produced by the same family that owns the bar. In the Alpujarran villages of Granada province, you get a free tapa (snack) with a beer or glass of wine—Granada is one of Spain’s only provinces to maintain this worthy tradition. What arrives may be a small plate of olives, a sliver of tortilla, a bowl of potato chips, or a slice of delicious jamón serrano (cured ham). The best ham in the area comes from Trevélez village, even higher in the mountains along a winding road. (All Alpujarran roads are winding, but some wind more than others.) At 4,840 feet, it’s the highest inhabited village in mainland Spain. If it’s a clear day, you can see the mountains of Morocco from here. The high altitude and pristine air produce ideal conditions for curing pork products, and just like quality wines, hams from the village are so highly rated that they have their own Denominación de Origen. Soportújar is the witch village—folklore tells of covens meeting here in bygone days. No doubt the local children were exceptionally well-behaved. One story goes that boys and girls who wandered out of the village would be snatched by witches and taken away to a cave known as the “Eye of the Witch.” There the witches would boil them in a cauldron and sell their fat to the dairy to be churned into butter and cream. In early August, Soportújar trades on its reputation and throws a fiesta to celebrate all things spooky. Though it’s from iron in the rocks rather than any witchery, Pórtugos village has a waterfall with a distinct reddish tinge. In early October, the San Isidro fountain in Cádiar also gushes red, but that’s not due to iron. During the village’s autumnal festival, the fountain spouts wine, and it’s free for whoever wishes to partake of a glass or two…or more. You’ll see far more if you rent a car, but public transport serves a number of villages. However you travel, bring sturdy boots. 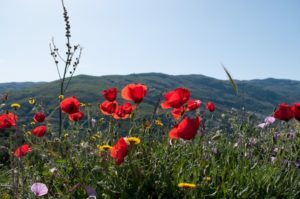 Even if you don’t aim to tackle the entire length of the GR-7 longdistance trail that passes through the heart of the Alpujarras, you’ll almost certainly want to take at least one hike. There are bars, small supermarkets, and a restaurant or two in all but the smallest hamlets.